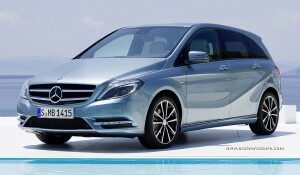 The new B-class will be unveiled at the Frankfurt motor show next month. Mercedes calls it a sports tourer, but it’s a compact hatchback to all of us. Compared to a Prius, it’s 3 inches shorter, but 3 inches taller. It has a really high roof line which shall make it convenient for families who often need to carry large items. High roofs are generally seen as a penalty when it comes to aerodynamics, but that is not the case here. The base B-class has an excellent .26 drag coefficient, and there’s more with an optional efficiency and aerodynamic package (BlueEfficiency), which lowers this value to an exceptional .24. The novelty is more than skin-deep as the car’s built on a brand new front wheel drive platform, and all engines also, gas and diesel, are new. All are turbocharged with direct fuel injection. The gasoline unit is a 1.6-liter that comes in 2 power levels: 122 or 156 hp. The diesel unit is a smaller displacement version of the 2.1-liter from bigger Mercs, it will offer 109 or 136 hp from 1.8-liter. The transmission will be a 6-speed manual, or a new 7-speed double-clutch automatic. That’s another first for a small front-drive Mercedes. Of course, all these new engines will be tuned to give a lot of torque at low revs, and that 7-speed automatic will be very quick to upshift. 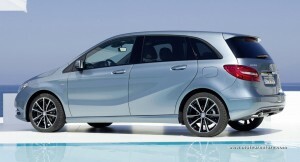 Mercedes hasn’t released any performance or fuel economy figures, but we bet the B-class will be a winner. Sweeping styles that elegantly propel tasteful individuals to exquisite parties in which you only are aware that a foil-wrapped nut and chocolate concoction would provoke suits of scornful laughter.